Losing weight is not a simple math equation of cutting calories. How many of you have cut calories, exercise and still not losing the weight? •	Maybe it’s more than cutting calories? •	Maybe it’s also more than diet and exercise? •	Maybe STRESS could be that missing pieces of your weight loss puzzle? Has Your Metabolism Shifted? Your metabolism is designed to burn most of its calories from the breakdown of fats 24/7, more so than from the breakdown of calories from lean muscle (protein) and carbohydrates. You can burn calories ALL Day long, but if you’re NOT burning calories from the breakdown of fats, you will always struggle with your weight, energy levels, cravings, mood swings, cellulite, inability to focus, difficulty in adding lean muscle and yes…chemical and hormonal imbalances! The first goal of Dr. Len’s Healthy Weight Loss Program is to restore your metabolism to function the way it was designed so your body can burn-off those unwanted inches, while at the same time increase your energy level. How does your metabolism effect your energy level? -	Your body produces energy by burning calories from the breakdown of fats, carbs and proteins. -	The secret is that when you burn fats, you produce two-and-a-half times more energy than you do when you burn carbs and proteins (lean muscle). -	This is why weight gain and fatigue seem to go hand-in-hand. -	The Solution to your inability to lose weight or have enough energy throughout the day begins by correcting your Metabolism. In To Burn or Not to Burn – Fat is the Question I explain how your metabolism is a lot like a fireplace, and that you have 3 types of wood to burn. 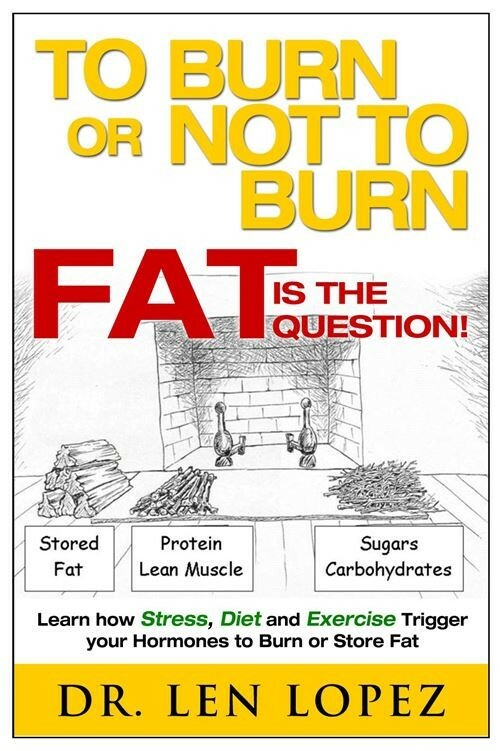 The big fat logs give off a lot of energy (heat) and burn longer than proteins and carbs. Whereas if you burn up your small branches (proteins) and twigs (carbs), you don’t produce as much heat (energy) and have to constantly re-supply the fire with more small branches and twigs. People who have to eat every few hours or their blood sugar drops or struggle with cravings, irritability are classic examples of people Burning the Wrong Fuel! Your Diet, Your Workout and Your Stress Hormones are what regulate your metabolism, which is explained in To Burn or Not to Burn – Fat is the Question. -	What you eat and drink controls your blood sugar, which activates various hormones. Some of those hormones trigger your metabolism to store fat, other hormones tell your body to burn fat! The question is which hormones is your diet activating more of? -	Stress triggers your adrenal glands to produce cortisol and adrenaline. This activates your metabolism to burn more carbs and protein. So, if you have cortisol constantly racing through your body all day long – this could be why you haven’t seen the results from all your diet and exercise efforts. Once you Restore your Metabolism to function the way it was designed – the easier it will be for your body to shed those unwanted inches and pounds, as well as, restore your energy level. Dr. Len’s initial consultation will review your diet, workout routine, if you have one, as well as, access possible Stress/Adrenal Overload, along with a review of your other health issues that may affect how your body functions.